Perhaps you have made New Year resolutions to start memorizing Bible verses. I have memorized many Bible verses in the past. Unfortunately, I have forgotten many of them. I have a big stack of Bible verse cards with verses that I memorized that now are very difficult for me remember. I’m very good at memorizing. My difficulty is staying disciplined so that I retain in long-term memory instead of short-term memory (is it really memorizing, then?). God has provided everything we need to live a godly life. Bible promises provide access to God’s power in our actual life. But many times I feel there is a block between the promises I try to memorize and their fulfillment in my life. I submit one simple idea: strive for quality, not necessarily quantity. The Bible should be read as God’s personal voice to us individually. Therefore, personalize the promises you memorize. Put the words I and me in the verse. I believe this can get some of us over the hump. If we memorize because we have a personal investment in the promises, they will be of much more benefit than if we just memorize out of obligation. We will know God better, and our character will grow. “In His promises and warnings, Jesus means me. God so loved the world, that he gave His only-begotten Son, that I by believing in Him, might not perish, but have everlasting life. The experiences related in God’s word are to be my experiences. Prayer and promise, precept and warning, are mine. “I am crucified with Christ: nevertheless I life; yet not I, but Christ liveth in me: and the life which I now live in the flesh I live by the faith of the Son of God, who loved me, and gave Himself for me.” Gal. 2:20. As faith thus receives and assimilates the principles of truth, they become a part of the being and the motive power of the life. The word of God, received into the soul, molds the thoughts, and enters into the development of character.” – Desire of Ages, p. 390.5. What is your experience with memorizing Bible verses? Random fact: I use Hetman valve oil in my trumpet. One day when I was thinking about the day of the Sabbath, I decided to write down all the possibilities and the types of texts/statements I would expect to see in the Bible if each one of them were true. 4. The Sabbath could be kept any day of the week since its beginning. 5. The Sabbath could be kept any day of the week since its beginning, but was changed to be a specific day of the week. -The act of resting (and not a day) blessed. -God’s people keeping different days throughout the week. -Reference to “Sabbath days/rests,” and not to “the Sabbath day/rest.” I could see the statement “A Sabbath day/rest” as going both ways. -Jesus keeping a day (not really specific). Clearly this is not what is seen in the Scriptures. In Genesis 2:1-3, “God blessed the Sabbath day and sanctified it.” He rested, but instead of blessing the act of resting, he blessed a specific day (the seventh day of the week). In Exodus 16, when God rained manna on Israel, they were to collect manna six days a week, but not collect manna on the Sabbath. When some of the Israelites tried to find manna on the Sabbath, God was displeased. But what if they kept Sabbath on the second or third day of the week? God was specific that the Sabbath mentioned in His commandments and laws was a specific day, the seventh (Exodus 16:28, 29). Any study of the history of the Israel/Jewish nation shows a consistent keeping of the Sabbath on the seventh day of Scripture (Sundown on Friday to sundown on Saturday). Thus, the only possibilities that remain are numbers one through three. -A person/power outside of the Bible changing the day. -No clear reference/commandment stating any change of solemnity from one day to another (i.e. the seventh day is no longer holy and you can now work; or that this other day is now holy and will be the Sabbath day). God would not give a vague or unclear commandment. The original 10 were very clear and proclaimed in great display from Mt. Sinai. -A clear reference/commandment stating any change of solemnity from one day to another (i.e. the seventh day is no longer holy and you can now work; this other day is now holy and will be the Sabbath day). God would not give a vague or unclear commandment. The original 10 were very clear and proclaimed in great display from Mt. Sinai. -Jesus keeping that a day, either the first one or the second one. -A clear reference/commandment stating any change of solemnity from one day to any day (i.e. the seventh day is no longer holy and you can now work; any day you choose can become your Sabbath day; rest, not a day, is what is important). God would not give a vague or unclear commandment. The original 10 were very clear and proclaimed in great display from Mt. Sinai. -Jesus keeping a Sabbath day (perhaps the original Sabbath, perhaps not). We already know how the Bible describes the blessing of the Sabbath day and how it was kept by the Israelites. The real question now is whether or not there was a clear commandment given to change the Sabbath in some way. Just by way of quick note, the Bible never mentions “the Sabbath of the Jews.” Since the Sabbath was given at Creation, the Sabbath applies to all mankind and the Bible refers to it as “The Sabbath of the LORD/Lord” (Exodus 20:10; Mark 2:28). Since the Bible doesn’t give any clear commands from God to change the Sabbath (This point seems too short, but I don’t know what else say about this), we’ll check for any evidence of the validity of a seventh day Sabbath in the New Testament before we settle on possibility number 1. In Luke 4:16 we see that Jesus kept the Sabbath in part by attending church services in Jewish Synagogues which would have been held on the seventh day. Luke 23:52-Luke 24:3 shows that Sabbath day according to the commandment (remember God’s statement in Exodus 16) was on the seventh day, the day before he rose again. Jesus resurrection is celebrated on a Sunday once every year, showing that the seventh day Sabbath (according to the commandment) is roughly on Saturday (sundown Friday to sundown Saturday, specifically). To avoid making an assumption, Matthew 5:17-18, Romans 7:7, Romans 13:8-10, and James 2:8-12 (among others) all mention that the laws applicable to the Christian today include the 10 commandments. In other words, the 10 commandments have never been done away with by God. Daniel 7 mentions that there would be a kingdom (the little horn) that would intend to (but not actually) change times and law. A proper understanding of this prophecy reveals that it is not God, but Rome that tried to tamper with the sacredness of the seventh day of the week (and they openly claim this in their catechism. This is no secret). Outside the Bible we find more evidence. In many languages today (take Spanish as an example), the day for Saturday (Sábado) is the same word as the Sabbath (Sábado). The weekly cycle has also never been disrupted. The evidence that many Christians cite today for sacredness of Sunday is the event of the resurrection of Jesus that first day of the week a long time ago. How does the Bible say how we should commemorate the resurrection? Romans 6 says that the death, burial, and resurrection of Jesus is symbolized by the water baptism of every Christian believer. The evidence is clear. Of the five possibilities, only one stands the test of investigation. The Sabbath has always been a specific day of the week. Suppose five frogs are sitting on a floating log and talking. Three decide to jump in the water. How many are left on the log? Five. They decided, but didn’t do it. All this talk about running, all this talk about running shoes. What good does it do if I don’t actually go running? How will I ever run a full marathon? There are so many object lessons to pull from this. Talk is cheap. I have a lot to learn. I stumbled across these jokes tonight on Facebook. I’m not sure where they came from (I’ll try and look later), but I think they’re pretty funny. Joke #2 – A physicist, a chemist, and a mathematician are all attending a conference, and staying at the same hotel. The first night, the chemist wakes up to the smell of smoke. Looking out into the hallway, he sees a fire. Realizing that he can stop the fire by lowering the temperature of the reagents with water, he quickly returns to his room, grabs the trash can in the bathroom, fills it with water, uses it to douse the flames, then returns to bed. The next night, the physicist wakes up to the smell of smoke. Peering into the hallway, he sees a fire. Looking down the hallway in the other direction, he sees a fire hose. He quickly calculates the proper angle to hold the hose in order for the water stream to travel exactly to the flames and douse them. After dousing the flames, the physicist returns to bed. On the third night, the mathematician wakes to the smell of smoke. Looking into the hallway, he sees a fire. Like the physicist, he also spots the fire hose. After thinking for a very long time, the mathematician proclaims triumphantly: “Ah! A solution exists!” and goes back to bed. Thanksgiving – Gratitude from the heart. It’s Thanksgiving Day! Today serves as a reminder (although brief and often neglected), that we should be thankful for things. Perhaps this is the most neglected part of Thanksgiving. We have so much to be thankful for, and I think many of us (self included) can learn to better express our gratitude. 1) The act of giving thanks should be a daily experience. The Bible says, “Rejoice always, pray without ceasing, in everything give thanks; for this is the will of God in Christ Jesus for you.” – 1 Thessalonians 5:16-18. The Bible tells us to “pray without ceasing.” And yet as part of that admonition, we are also told “in everything give thanks.” Ever wonder how you could pray without ceasing? Keep a spirit of gratitude, and tell God what you’re thankful for. This is a legitimate and important part of prayer. It’s also God’s will (command) for you. 2) It feels good to give thanks. The Bible says, “Be anxious for nothing, but in everything by prayer and supplication, with thanksgiving, let your requests be made known to God; and the peace of God, which surpasses all understanding, will guard your hearts and minds through Christ Jesus.” – Philippians 4:6, 7. In this verse, thanksgiving is again associated with prayer. The result of this kind of prayer is an amazing sense of peace that God will give us. Notice it guards our hearts and minds. It brings change to our emotions and changes the way we think. I honestly believe depression would be a lot less common if we continuously gave thanks. The brain cannot dwell on positive and negative thoughts at the same time. If we replace negative thoughts with positive thoughts, then a change will occur in our mind. Choices and thoughts form physical pathways in our brain that grow bigger and stronger with repetition (habits). Our brain can actually be changed by following a different choice of action (in that way, 2 Cor 5:17 is a reality when it says Christ can make us a new creation. Our brain chemistry can actually be changed). Complainers are seldom happy. Give thanks instead! I remember the story of a minister who visited a woman who was filled with depression. He thought the act of thanksgiving would help her, so he asked her to list some things she was thankful for. Her condition had gotten so bad that she couldn’t think of anything! So then he asked her if she was thankful for her toothbrush. Yes, she was (even though she thought it was silly). But starting from there, she was able to start listing things she was thankful for, and as a result her attitude was completely changed. She became free from her depression because of her expression of gratitude. Even if we don’t feel like it, expressing gratitude can change us so that we are truly thankful. As an exercise, speak only positive words for the next two weeks. No critical speaking of anyone or anything. It will make a difference. 3) This lifestyle is an excellent witness. Who do you thank when you give thanks? Ultimately, our thankfulness is towards God. Thankfulness cannot exist alone, it must be expressed to someone else. When you’re with friends, express thanks. “I’m thankful for the weather today.” “I’m so thankful for learning this…” Perhaps your friends will wonder, “Thankful to whom?” To God. Yes, I believe in a God who loves me, and I tell Him thanks. I’m very good at forgetting things, losing things, or breaking things. For example, this past year I’ve: lost three water bottles (got it back the last time), forgot my camera in a restaurant after GYC and forever lost it, lost two USB sticks, lost important music for a summer trip, locked myself out of my car twice (once while it was running), dropped my computer and broke the hard drive (my second lost hard drive in just over a year), and left my phone on the roof of my car and drove off and lost it. That’s not an exhaustive list. I don’t know why I do these things. I don’t consider myself to be dumb or incapable. I’ve started keeping a ToDo list and writing a schedule for myself. That’s helped a little, as it has relieved some of the mental stress of trying to keep track of everything. But even then I still do stuff like this and it drives me crazy. I’m ashamed of it but it seems there’s really nothing I can do about it but live with the consequences of my random mishaps. It’s frustrating and humbling to have to mention what I did to someone else, or to hear someone mention it. Part of the reason I haven’t been updating my blog is because I haven’t been able to use my computer. I had a post-it note on my desktop with a list of all the blog topics I was interested in writing about. Now that I use computer labs, I don’t want to put forth the effort remembering topics and taking the time to write about them. I guess it’s part of life that I have to learn to deal with it. Any suggestions? Random fact: I was born on a Saturday. It’s been 79 days since my last post. Does the fact that I have a blog mean I am obligated to update it? If so, I have failed. To be technical, I have no obligation to write. But, since I want people to read my blog, I should probably give them something to read. Anyway, since that time, I’ve written down eleven potential topics for future blog posts. The topics range from my concerts, happenings from my summer, sermons and thoughts on Scripture, looks at the past, and a random one or two. I think it’s about time I start writing. I’ve been looking for productive things to do with my time, and I’ve decided that one of those is to start blogging again. The only things I have left to decide is which topics to write about and in what order. I’ve decided to include a random fact with each post. I used to do this on my old Xanga blog and I’ve decided to do it again. I hope you enjoy! Comments are appreciated (but not required). Back in 2001 I began to play Papyrus’ NASCAR Racing 4. NR4 was a racing simulation that incorporated amazing physics and graphics into Papyrus long NASCAR Racing series. My dad bought me a steering wheel and pedal set and I began to race online against other people. To play online I had to create a online username. I’m not sure how long I thought about it, but I came up with bgcatfan. BG is short for Bowling Green, where I live and grew up. Fan is, well, a fan. I rooted for Bowling Green sports teams and was a Ward Burton fan. Funny enough, when racing online, I was asked more than once if I was a Kentucky Wildcat fan. No, I’m not from that Bowling Green. Haha. When Gmail came out, I chose not to get a personal email. I had an email from my dad’s website, and in a few years I would use @bgsu.edu and @umich.edu for my mail email. I did create bgcatfan[at]gmail for different website registrations, orders, and to keep in contact with people that I raced against. Now, I’ve decided I want to use Gmail more, in part because the leadership of our campus ministry is using a Google group to communicate. I’m really enjoying the level of communication we are having this way. I’ve set my BGSU and UMich emails to forward into my Gmail account. I still won’t use Gmail as a permanent email address, as I can use one from my own website, but I’m enjoying having everything come to one place and have multiple emails filed within a single “conversations.” It also makes it easy to access the Google group. I no longer race NASCAR games online, but bgcatfan has stuck. 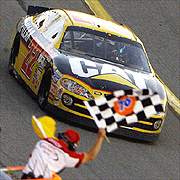 I am still a fan of Bowling Green, but Ward Burton has long stopped racing in NASCAR. 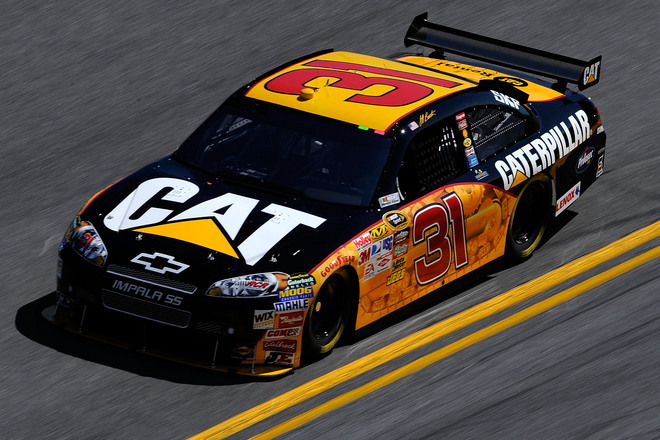 Interestingly enough, one of my favorite two drivers today is Ward’s brother, Jeff Burton, whose car is sponsored by none other than Caterpillar. I am still a bgcatfan. Jeff Burton in 2010 Daytona 500 practice.